It all begun when Esther Wojcicki started teaching at Palo Alto High School 30+ years ago. Over the next three decades, she built the 6 page, 19 person student newspaper, The Campanile, into a 600 student, 10+ publication, program in a 25,000 sq. ft. center dedicated solely to journalism and the media arts. Today, the program is the largest journalism program in the United States. To learn more about the program, visit the Media Arts Center's website below. Media Arts Institute (MAI) is a nonprofit educational organization whose mission is to inspire and educate digital learners and aspiring media professionals through its productions, curricula, workshops and forthcoming publications. Esther is a co-founder of the Media Arts Institute. Currently, they are working on implementing journalism curriculum into schools across the country. Almost all of the curriculum was developed through the many years of teaching by Esther. To learn more about the Media Arts Institute and on how you can implement journalism curriculum into your classroom, visit their website below. Esther Wojcicki, a pioneer in the field of instructional technology and the author of Moonshots in Education, first went 1:1 with Macintosh computers in 1985 through a grant from the State of California. Her journalism program at Palo Alto High School is regarded as the best in the country and has more than 600 students. We’re crafting a digital platform with a compelling game-based narrative that utilizes real-world data and Next Generation Science Standards (NGSS) to deliver better learning outcomes. Our curriculum, woven through immersive 3D experiences, will inspire teachers and students to understand the intricate connections between Science, Technology, Engineering, Arts, and Math (STEAM) subjects and our changing planet. Esther serves as the Chief Learning Officer for Planet 3, adding the educator's touch in developing innovative curriculum for middle school STEAM subjects. Esther is contributing her vast experience to review and refine Planet3's instructional approach to embed her project-based learning tenets. She also helps building Planet3's strategic alliances with technology providers and educational thought leaders. To learn more about Planet3 visit their site below. Esther Wojcicki is Vice Chair of Creative Commons. 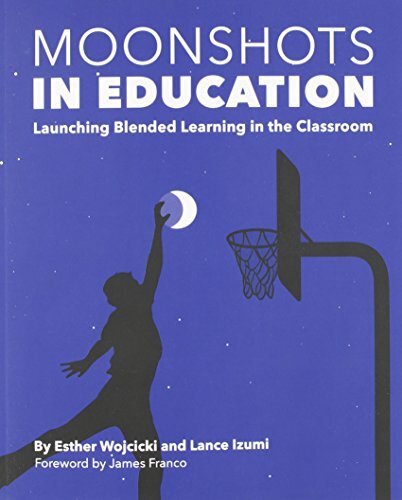 Moonshots in Education explores digital and online learning in the classroom and what it takes to make a "moonshot." It gives several models and examples of schools that are already implementing digital learning and what the success rate has been. It also provides philosophical discussion a variety of educational philosophies and how each one empowers students and teachers. The book also provides tools to support teachers in most subject areas. The forward by James Franco explores how this type of blended real world learning has made a significant positive impact in his life. The main ideas contained in the book are leading to a movement with lots of interest from around the world leading to multiple speaking engagement requests for the author. Examples of these requests are from school districts, TED, Prime Ministers and United Nations to name just a few.